Thank you for your interest in Siemens hearing aids. In January 2015, Siemens AG closed the sale of Siemens Audiology Solutions to EQT. At that time, Siemens Audiology Solutions was renamed Sivantos Group. Binax was the last generation of hearing aids exclusively using the Siemens brand. The next generation of Siemens hearing aids, Primax, were co-branded Siemens/Signia (as shown in the image below with Siemens written on one side of the hearing aid and Signia written on the other). These hearing aids are very much built using all of the technology and research that went into years of Siemens products, and had many exciting updates from the Binax platform. 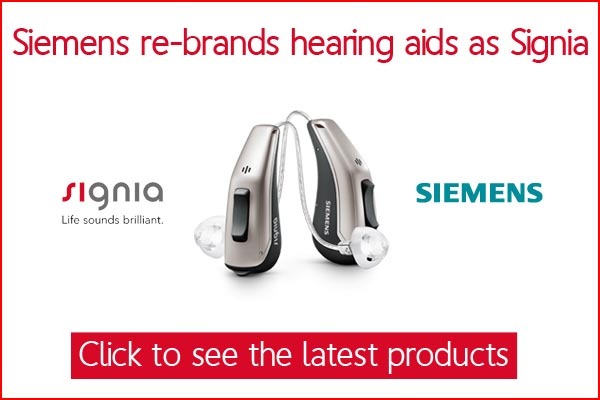 The most recent generation of hearing aids offered by Sivantos Group is Nx, which will exclusively use the Signia brand. For more information on the latest Primax and Nx products which build on the rich history of Siemens, please visit our Signia page by clicking here. In order to emulate natural binaural listening and its advantages, the two binax hearing instruments are linked. The outstanding e2e wireless™ 3.0 data transmission technology enables exchange of audio signals between two hearing instruments, so they can work with input from both ears just like the brain. As a result, the hearing instruments not only use the information picked up by their own two microphones, but also the acoustic signal from the two microphones of the other hearing aid. This way, each hearing instrument works with input from four microphones. So together as a bilateral pair, these hearing aids create a virtual eight-microphone network. e2e wireless 3.0 creates a virtual eight-microphone network. As with our previous wireless technology, e2e wireless 3.0 transmits information for feature management and user control changes (2). Now with binax, it also wirelessly processes and exchanges audio signals (1), thus creating binaural features that can be engaged whenever they are needed. binax: Outperforming normal hearing – with minimum power consumption. What’s more, this outstanding hearing technology is incredibly energy efficient. binax solves this problem with a remarkable new low-power consumption breakthrough: While providing outstanding HDSR, the revolutionary e2e wireless 3.0 technology requires just 1.6 mA for the transmission of audio signals. As a result, all binax features within – binaxFocus, binaxSound, and binaxGuide – can be engaged automatically and as often as necessary to offer a binaural hearing experience whenever it is needed. Advanced binax features for a new level of Soundability. The combination of HDSR with low power consumption enables three binax key features: binaxFocus, binaxSound, and binaxGuide. Together, these features create the perfect equilibrium between sound quality and audibility for each individual wearer – raising the bar for Soundability. binaxFocus’ narrow directionality automatically focuses on the speaker immediately in front of the wearer. It is able to narrow the beam of the directional microphone and to help wearers understand speech in noise. In fact, clinical studies have shown that it is so effective that it allows users to understand speech better than those with normal hearing in situations like cocktail parties. As soon as the car situation is detected, where wearers cannot turn their heads to face the speaker, Spatial SpeechFocus automatically focuses in on the main sound source – be it from the front, back or even sides – while at the same time attenuating noise from other directions. binaxSound continually monitors both hearing instruments and strategically uses audio signals from the side with the better sound quality while reducing other noise sources. Thanks to HDSR, unmatched spatial awareness is maintained. Additionally, binaxSound’s binaural eWindScreen™ preserves a high level of sound comfort – even in the most difficult windy situations. As an addition to automatic functions that adapt to changing acoustic environments, spatial configurator empowers wearers to take flexible control of how and what they want to hear. They can individually adjust the span and direction of their directional microphone focus beams, and decide how much audio input they want to hear. To find out if the new Siemens Binax hearing aids are the right solution for you, please contact our hearing health care providers at our location closest to you or contact us through the form bellow.